Dr Morag Park, an associate member and research director for two of our PhD candidates in the department of Pathology, is the recipient of the Canadian Cancer Society 2017 Robert L. Noble Prize, as announced on March 8. An acclaimed leader in Canadian cancer research, Dr. Park is widely recognized for her outstanding work in identifying key events in cancer development and the importance of tumour surroundings for cancer growth. 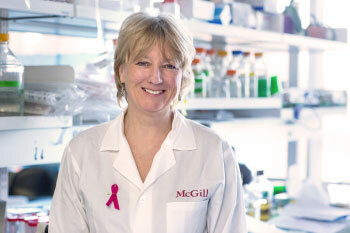 She has also demonstrated exceptional leadership in establishing national cancer research strategies as acknowledged by the Canadian Cancer Society. The Robert L. Noble Prize is given for outstanding achievements in basic biomedical cancer research in honour of Dr. Noble, an esteemed Canadian investigator whose research in the 1950s led to the discovery of vinblastine, a widely used anticancer drug. The award comes with a $20,000 contribution to the recipient’s research program.